Michael Harper, Camden Fire Department chief, said seven injured firefighters have been released from the hospital. Over the July Fourth holiday weekend, 16 fires that blazed across Camden were intentionally set, police said, burning in 14 vacant buildings and two cars over 43 hours. On Thursday morning, less than three days after the last fire was set, a police officer searching for the suspect in the arsons found him walking down Federal Street. Charles E. Ricks Jr., 44, later confessed during "an extensive interview process," police said at a Friday afternoon news conference. Ricks has been charged with the 14 fires set inside vacant houses; police said they are looking into whether he is behind "several other arsons" over the last several months. They declined to comment on a possible motive for the fires, or a method for the arsons, citing the ongoing investigations. "This was an all-hands-on-deck investigation. 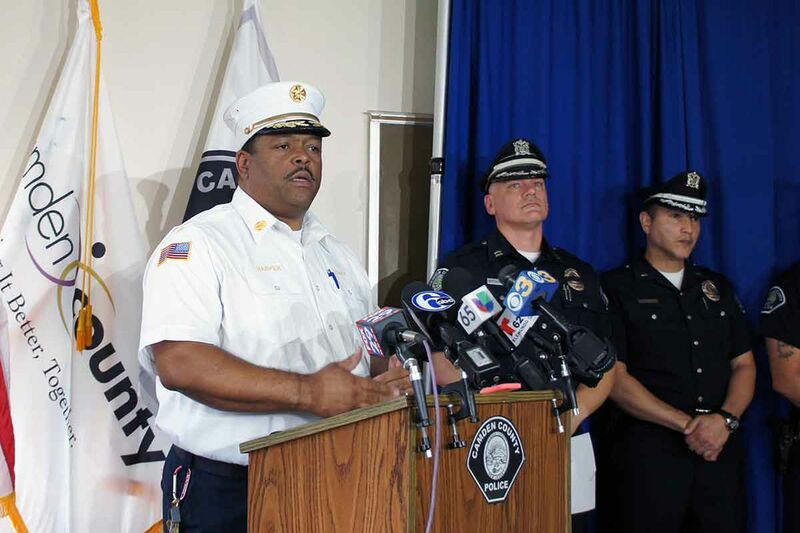 The City of Camden was terrorized over the Independence Day weekend," said Capt. Richard Verticelli of the Camden County Police Department. The string of fires began with one on the 1800 block of South Sixth Street just before 5:30 p.m. Saturday. Three more homes burned that day, followed by nine homes and two cars the next day. On July 4, a home on the 1100 block of Mount Ephraim Avenue began burning shortly after 12:30 p.m. Dozens of detectives canvassed the area, Verticelli said, going door to door to find witnesses. The department also used its reverse 911 system to call residents and ask any witnesses to step forward. From those interviews, Verticelli said, police were able to put together a description of a man they believed to be the arsonist. Going through police, business, and residential camera systems, they created a timeline that showed the man's path as he moved through the city. Orlando Cuevas, the assistant police chief, called it "some of the best detective work that I've seen in my 26 years here." Around 7:30 a.m. Thursday, an officer searching for the man found him, Verticelli said. Ricks was in the county jail on $200,000 bail. Police said they believe he acted alone. "A serial arsonist has been removed from the city streets, which renders Camden a safer place," Verticelli said. Michael Harper, chief of the Camden Fire Department, said seven firefighters who were injured over the weekend had all been released from the hospital. Most had physical exhaustion from the heat and pace of fires, he said; one firefighter had a dislocated or broken thumb. One firefighter remains out of work while he recovers from carbon monoxide poisoning from smoke inhalation, along with some cardiac issues.